Reformed Baptist Blog: The American Revolution: Was it Biblical? How Christian was the American Revolution? The answer perhaps depends upon how we understand the question. If we seek to know whether there was an adequate biblical justification for the Revolution, we probably cannot give a very satisfactory answer because while there were many Christian patriots who supported the Independence movement, there were many Christian Tories who supported submission to Great Britain and many Christian pacifists who thought that war under any circumstances was wrong. In other words, Christians disagreed on whether the Revolution was a part of God’s will. If, however, we seek to know whether the Revolutionary movement was sustained by Christian ideals, we can probably come closer to saying that the Revolution was indeed Christian, since so much of the Revolution's ideological underpinnings were theological arguments advanced by Christians. Christians seeking a scriptural perspective on a possible war with England were especially challenged by Romans 13:1: "Let every person be in subjection to the governing authorities. For there is no authority except from God, and those which exist are established by God." This verse was an obstacle to many Christian colonists. How could a Christian support independence in the face of such a clear statement that God ordains all governmental authority and obedient Christian citizenship requires submission to such authority? Anglican minister Jonathan Boucher of Maryland, for example, concluded in a 1775 sermon that "obedience to government is every man's duty . . . because . . . it is enjoined by the positive commands of God." Loyalists (those who opposed the Revolution) numbered about one-third of the American population and many of them cited Romans 13:1 as the basis of their loyalty to the mother country. Patriot ministers regularly preached on the theme of liberty as well. If God's people had "been called to liberty," as Galatians 5:13 promised, meaning liberty in Christ, then it did not seem too much a stretch to believe that this also meant freedom from political tyranny. This theme was further supported by the social contract and natural right theories of such philosophical divines as John Milton, Algernon Sydney, and especially John Locke. Modern researchers have affirmed that outside of the Bible, the writings of John Locke were the most frequently cited source for justifying the Revolution. As for Barton's allusion to Old Testament examples of rebellion against a governing authority, I would respond that, in my view, these cases were all instances of God's special revelation that such should be done or of His divine intervention on behalf of a people whose position was that of a national entity under His rule. Can we really apply such cases in the history of national Israel to the Church? I think not. I think this would fail to properly take into account the differences between the nature of the Old Covenant people of God as a nation among nations and the New Covenant people of God as a family of believers from among all nations. Under the Old Covenant the very nature of the case often required rebellion against foreign oppressors or the overthrow of wicked kings, and then only with Divine sanction and guidance. But the New Covenant Church is not such an entity. As Jesus said to Pontius Pilate: “My kingdom is not of this world. If My kingdom were of this world, My servants would fight, so that I should not be delivered to the Jews; but now My kingdom is not from here” (John 18:36 NKJ). As for part two of Barton's argument, I suppose we would have to debate whether or not the Revolution was in reality a war of self defense or whether or not it was the resistance of an authority that had the right to quell opposition by means of force. As I consider this notion in the context of Romans 13, I can't help but wonder why the early Church did not avail herself of such an argument, especially when one considers just how unjust the Roman government could often be in its use of force. But notice that this argument assumes that it would be right for a lesser authority to seek to overthrow a higher authority in the first place. But what if it isn't right? Does Paul assume in Romans 13 that it would be right? Or does his position indicate that it would be wrong? It appears to me that it would indeed be wrong, because it would in any case entail resistance of a God ordained authority, and such resistance would be considered sin by Paul. In fact, couldn't I argue on the basis of Romans 13 that, when a lesser authority requires me to disobey and resist a higher authority, I must disobey that lesser authority because it is requiring me to sin against God? Readers of this article may also be interested in my post entitled A Memorial Day Reflection on Christian Patriotism. See also Jeff Johnson's article entitled Giving Uncle Sam His Due. Good article Pastor. I often find that when we are seeking self justification for ourselves we gloss over simple biblical principles. At the same time some will also say that because sin is involved in the founding of the United States that it invalidates our Nation as being a Nation. How would you address that kind of a statement? I have some idea on how I would address it but look forward to know, as Paul Harvey would say, "The rest of the story." Most important, the ideological historians tended to equate constitutionalism with the fungible concepts of politics rather than recognize it as a principled expression of deep-seated belief in the law. The law, these scholars claimed, had largely failed as a guide in the midst of the Revolution’s constitutional crisis... Moreover, Reid finds that Americans and the inhabitants of Great Britain were animated by a common desire: to live under a rule of law. In this sense, the Americans were not rebelling but instead attempting to restore an understood relationship between government and the governed in which the former owed a duty to the latter based on law. It was, in fact, the arbitrary actions of the English Parliament that stirred resentment and prompted the colonists to demand that they be treated like what they thought they were Englishmen. This statement doesn't make any sense: "I thank God that by His sovereign will I am a citizen of the United States of America", yet you declare that what the founders did was a sinful act of rebellion and disobedience to Romans 13:2. So it was God's will that His own law be broken?? It is entitled "Is the 'God of Calvinism' the God of the Bible?" and in it I addressed the issue pretty directly. "The question then must be asked in every particular instance, what legal authority does the lesser magistrate in question have to resist the higher magistrate. This was precisely the question of the American Revolution." My question is "What Biblical authority does the Christian have in joining the lesser magistrate in question in resisting the higher magistrate?" Even if there is a legal right for a lesser magistrate to rebel, it doesn't mean that the law allows a Christian to do so when the Bible says he should not. "I'm looking forward to reading John Philip Reid's work on the Constitutional History of the United States. His work explores the reality that Americans were concerned with the rule of law and about the legality of their separation from England." "This has some parallels to Acts 22:22-29." "If we want to apply the question to our lives today, then we have to recognize that the Constitution is the authority, not whoever holds office (as opposed to Caesar's rule). Thus if someone holding office is acting unlawfully, they are not acting from an office of authority." But, does the Constitution trump Scripture for the Christian? For example, even if the Constitution itself grants us the "right" to rebel against the government (which it does not, to my knowledge), we are bound as Christians not to do so because Scripture says otherwise. Thus, rebellion might be technically legal, but it doesn't make it right for the Christian. Very confused here. If the government is adopted by men and that makes it suspect, yet the authorities are approved and authorized by God are we not at an impasse? What constitutes good government? Where is military service in this mismash?Is not pacifism and a que sara sara mentality enjoined? If we fight within the law but it is only created by men and is therefore suspect where is the authority to fight for the proper interpretation of the law? If the authority for the state is God and He appoints it are we not obligated to fight for the state? If I am confused please unconfuse me. I am not on your level of expertise but it seems to me this is tantamount to passivity and pacifism. If so...it seems we should be uninvolved politically. We sin if we turn left. We sin if we turn right. At any rate, as the article I have written demonstrates, the debate among Christians leading up to the Revolution was not about whether or not they were actually English citizens, but was about whether or not the Bible allowed them -- as English citizens -- to revolt against their sovereign. And I have concluded that the answer to this question is a resounding, "No!" First of all I have to state that I myself am looking for clarity on the issue of submission to government from a Biblical perspective, as the more I research, the more confusing it all seems to become. The only way I can suggest to fing any personal clarity on the matter is to first humble one's self, even to the point of putting aside all self-will, then pray and ask that God would give wisdom, (James 1:5-KJV), then read the whole Bible line upon line, precept upon precept, as the WORD of God. Many things in the Bible--such as when one writer records a commandment but another part of the Bible praises an example of what seems to oppose that command--are viewed by the world and even as Christians as contradictions. I submit that they may in actuallity be contrasts for the sole purpose of preventing a person from taking one side of a debate out of context and to some radical extreme. All that being said we must get our information from the true source. "Let every soul be subject unto the higher powers. For there is no power but of God: the powers that be are ordained of God. "-Romans 13:1. This is much different from the penknifed version cited in this and many other such articles, and potentially sheds a whole new light on the issue. First of all, if all power is from God, such as that which establishes individual governments, must we not accept also, (at the very least the possibility) that that which overthrows them also comes from God? And this is no contradiction as one commenter on this site suggested. God used many wicked rulers and nations to punish His people and to bring them back when they had turned away from Him. Many people on the one side cite that Christ and Paul were both praised in the Bible for submitting even to one of the most evil governments ever to rule, while those on the other side cite how Gideon, Samson, and Ehud are praised by the Bible for "rebellion", "insurrection", and even assassinating a ruler. What I have yet to see is anyone citing the actual context of each example. In the case of the Old Testament, the book of Judges and most of the rest of the OT display that the Jews followed a generational pattern. A Godly man led them and everything was good. The Godly man died, the people turned from God, and were thus given over by God to ungodly, tyrannical leaders to be oppressed. It was only when the people in mass recognized their sin, repented, and asked God for deliverance, that God sent deliverers such as Samson, Gideon, and Ehud to free them from oppression by overthrowing the very rulers the He Himself had previously established. Note also that every wicked nation God used to punish Israel were also in due time punished for their own misdeeds. In the case of Christ and Paul submitting to the Romans, the Roman government was established for the fulfillment of prophecy, as the willing, sacrificial, substitutionary death of Christ on the cross was His very purpose for coming into the world. And Paul, by submitting to arrest and torture, (even tough as a Roman citizen* he did not have to), was able to witness to several Roman officials and even Ceaser himself, influencing them in a way that possibly made life somewhat easier for other Christians for a time, considering that none of the top rulers found any fault and at least one was almost converted. I am not trying to condemn or justify either view absolutey. As I stated I am seeking clarity myself. One thing I do know with certainty is even if it is right under some circumstances to stand against an oppressive or corrupt government, we should first examine ourselves to see if perhaps we deserve such a government for the way we are choosing to live. It is true that God is the author of life and liberty, but seemingly contrary to the declaration of independence, God does on occassion authorize men, even tyrants, to take one or both, as is His right as God and Creator to do. And before anyone asks in what way we may have turned away from God, ask these questions in my next post. "All that being said we must get our information from the true source. 'Let every soul be subject unto the higher powers. For there is no power but of God: the powers that be are ordained of God. '-Romans 13:1. This is much different from the penknifed version cited in this and many other such articles, and potentially sheds a whole new light on the issue." "Many people on the one side cite that Christ and Paul were both praised in the Bible for submitting even to one of the most evil governments ever to rule, while those on the other side cite how Gideon, Samson, and Ehud are praised by the Bible for 'rebellion', 'insurrection', and even assassinating a ruler. What I have yet to see is anyone citing the actual context of each example." What I have yet to see is your clear citation of the actual context of each example. I also don't see how you could have missed my having dealt with such things in my article, where I pointed out that there is a big difference between God commanding His people -- at that time constituted as a national entity among other nations -- to rebel against a foreign oppressor and our taking it upon ourselves to do so. For example, I dealt with Barton's arguments along this line when I argued, "As for Barton's allusion to Old Testament examples of rebellion against a governing authority, I would respond that, in my view, these cases were all instances of God's special revelation that such should be done or of His divine intervention on behalf of a people whose position was that of a national entity under His rule. Can we really apply such cases in the history of national Israel to the Church? I think not. I think this would fail to properly take into account the differences between the nature of the Old Covenant people of God as a nation among nations and the New Covenant people of God as a family of believers from among all nations. Under the Old Covenant the very nature of the case often required rebellion against foreign oppressors or the overthrow of wicked kings, and then only with Divine sanction and guidance. But the New Covenant Church is not such an entity." Unless self-defense is not allowed under the New Covenant, I don't really see the problem. I would also say that I'm not convinced Romans 13 applies in this situation. Verse 4 tells us that government (as ordained by God) is "a minister of God to you for good." If a government is performing evil actions against its people (like initiating war on them, for instance), by definition that government cannot be defined as "a minister of God to you for good" since the Almighty does not sanction evil nor consider evil to be good. Had the British government been acting justly and in a definitely good manner (as per Romans 13:4), then the American Revolution would have been evil indeed. Seeing as the British government were acting sinfully and against God's intentions for civil government, Romans 13 isn't referring to that kind of government. Last point: IF the article is correct on Romans 13, then even civil disobedience is wrong and condemned. Using this logic, there is no middle ground -- we MUST obey the civil magistrate in ALL things -- period -- IF that is what Romans 13 is trying to say. Obviously, there's a problem with that then, since a civil magistrate can hardly order us to follow another religion (for example) and desert the name of Christ and still be considered "a minister of God to you for good." Actually, you didn't deal with Barton's claim that the Revolution was a defensive revolution in nature -- you devoted two sentences to it and said it was up for debate. If Barton was correct (and I say he was), then the argument against the justification of the Revolution gets a lot more difficult. Why do I think Barton's claim is correct? Basic to our understanding of the American Revolution is the belief of the American colonists that they were NOT under the supreme authority of the British Parliament, but only owed allegiance to the King of England. The colonial charters were contracts between the founders of the colonies and the King. Parliament was not involved. If these charters had been mere grants and not contracts, then the colonists were deliberately deceived, any legal ties were void, and the colonists were absolved of allegiance to the King the moment they landed in the new world. It must be remembered that (unlike the French and Spanish colonies) 12 of the English colonies were settled by individuals without any aid from the Crown or Parliament. The founders of Georgia had received some aid, and perhaps New York received funds -- but only for overthrowing the Dutch. Because of the actions of the British government, by 1776 the colonists could charge English foreign policy with ingratitude as honestly as England could charge them with being ungrateful. All the charters, particularly those of the New England colonies, granted companies and proprietors full executive, legislative, and judicial authority. Parliament was not involved and the King only had restraining power -- if that, since the Rhode Island and Connecticut charters did not even involve the King. In short, the charters of each colony laid down in the written law that the colonies had full (not partial) control over their own executive, legislative, and judicial affairs. When Stephen Hopkins (Baptist governor of Rhode Island during the French and Indian War) said "The King and Parliament had no more right to make laws for us than the Mohawks", he was merely quoting the common written law throughout the colonies. This is significant, because it defines Parliament's actions in levying taxes against the colonies as being definitively illegal, and defeats your argument that the British government was "an authority that had the right to quell opposition by means of force.". Parliament and the King were overthrowing and rebelling against the law, not the Americans. The Americans, then, were merely defending their property against an aggressive thief. You say that "this seems to fly right in the face of just about every history book on the subject I have ever read." That speaks more to the rather pitiful level of education that is current in the USA in our day. I take it you've never heard of the Prohibitory Act of 1775, then? That was the de facto declaration of war by the British government against the American colonies at least 6 months before the Declaration of Independence was signed. The "justification" for the Prohibitory Act speaks to the level of misinformation, double-speak, and factual revision that was governing the British Parliament at this time. 2) They had raised an army and engaged his majesty's soldiers. This was true -- yet only after the British military had illegally occupied Boston and was engaged in the theft of private property throughout Massachusetts. 3) They had illegally taken over the powers of government. This is the most revisionist of all -- the complete opposite was true, as it was the king and Parliament who had taken over the powers which legally belonged to the colonists alone. 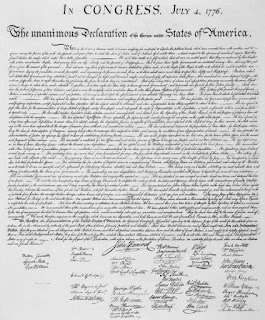 The Act declared all Americans to be outlaws beyond the king’s protection even while conservative American leaders were working with their British counterparts to craft a settlement to present to the King and Parliament that would end the fighting between colonial and royal forces, protect the colonists from unconstitutional parliamentary legislation while at the same time stopping short of a declaration of independence. The Prohibitory Act effectively ended any chance for reconciliation -- and also de facto declared the Americans to no longer be British subjects, since the Act declared them to be "open enemies". Over and over again the Americans sought peace, and over and over again the British government and monarchy flaunted the law to the point of making war upon them I repeat my previous point: Unless the New Covenant denies men the right of self-defense, and/or might makes right and the powers that be can be a law unto themselves, the American colonists were perfectly justified in their resistance to an invasion by an unlawfully-acting British government. John Stott was correct -- if we hold to the theory of a Just War, then by logical extension we must also accept the theory of a Just Revolution under the same principle of self-defense. The American War for Independence easily falls under that category. "And that also there shall be a Council, established here in England, which shall, in like manner, consist of thirteen Persons, to be for that Purpose, appointed by Us, our Heirs and Successors, which shall be called our Council of Virginia; And shall, from time to time, have the superior Managing and Direction, only of and for all Matters that shall or may concern the Government, as well of the said several Colonies, as of and for any other Part or Place, within the aforesaid Precincts of four and thirty and five and forty Degrees abovementioned; Which Council shall, in like manner, have a Seal, for matters concerning the Council or Colonies, with the like Arms and Portraiture, as aforesaid, with this inscription, engraver round about on the one Side; Sigillum Regis Magne Britanniae, Franciae, & Hiberniae; and round about on the other Side, Pro Concilio fuo Virginiae." "Also we do, for Us, our Heirs, and Successors, DECLARE, by these Presents, that all and every the Persons being our Subjects, which shall dwell and inhabit within every or any of the said several Colonies and Plantations, and every of their children, which shall happen to be born within any of the Limits and Precincts of the said several Colonies and Plantations, shall HAVE and enjoy all Liberties, Franchises, and Immunities, within any of our other Dominions, to all Intents and Purposes, as if they had been abiding and born, within this our Realm of England, or any other of our said Dominions." As for your further arguments about the Prohibitory Act of 1775, they are simply beside the point if, in fact, the colonists were still English citizens, which they were. Thus the British government was not a foreign government at all, and, even if this government acted unjustly toward its citizens, the question is still whether or not the Bible allows Christians to rebel against a God ordained government, whether or not that government is just. And the answer to that question must be, "No, it does not allow such rebellion in any case." Now, this is not to say that all instances of self defense would be wrong. It is simply to acknowledge that rebellion against a governmental authority would be wrong. As I said in my article, "As I consider this notion in the context of Romans 13, I can't help but wonder why the early Church did not avail herself of such an argument, especially when one considers just how unjust the Roman government could often be in its use of force." The Apostle Paul clearly said, "Let every soul be subject to the governing authorities. For there is no authority except from God, and the authorities that exist are appointed by God. Therefore whoever resists the authority resists the ordinance of God, and those who resist will bring judgment on themselves" (Rom. 13:1-2). Paul wrote this to Christians in Rome, Christians who lived under a typically oppressive and unjust government, especially toward those who were not actually awarded the status of Roman citizens even though they lived under Roman rule. But Paul wanted them to know that resisting even such a government as this would be wrong for a Christian. How can we be in doubt about what he would have written to a colonist and citizen of England in the 18th century? Does he not clearly assert that "every soul” must be subject to the governing authorities, that there is “no authority” that has not come from God, and that all the “authorities that exist are appointed by God” (vs. 1). Does he not further clearly assert that “whoever resists the authority resists the ordinance of God” (vs. 2). How on earth can this be read not to include the governmental authorities over the English people? You may think that my position "speaks more to the rather pitiful level of education that is current in the USA in our day," but I think I have demonstrated enough knowledge of the issue to be able to establish that the colonists were indeed English citizens. I can also assure you that I have had a pretty good education in Biblical exegesis and hermeneutics, and I will remind you again that my article is about whether or not the American Revolution was Biblical. So, again, I think it behooves you to offer some Biblical arguments for your case, yet you really haven't offered any Biblical argumentation at all. Supposing you are correct, which I doubt, this argument would only have any real force if my ultimate authority was "Reformed ... interpretation." I established my arguments on Scripture precisely because Scripture is my ultimate authority. Well, I can only say that assertions are not arguments. And good arguments offer supporting evidence for their assertions, especially when those assertions are set forth as such a sweeping generalization. I seriously doubt that you could prove the validity of such a strong generalization as "the vast majority (if not all)" of the "Reformed pastors and theologians of the Revolution era" would argue the way you have said. However, even if you could prove its validity, it still wouldn't amount to a Scriptural argument. And, since the question under discussion in the article is whether or not the American Revolution was Biblical, I think it behooves you make your arguments from the Bible.